IREPS provides a new feature for their users, using which they can search the purchase orders or contracts published by different Zonal Railways and Production Units. Purchase Order or Contract are awarded to a vendor which fulfilling all the criteria for the tender and quoted the lowest rate for that particular tender or item. Open the home page of IREPS website i.e. www.ireps.gov.in and click on Contracts button. Click on the link Supply Contracts (Zonal Rlys). It will open the search page for purchase order (PO). Select a date range and click on the Show Results button to see all the purchase orders (POs) or contracts awarded to vendors within that duration. You can also define the value of contract or PO in Lakhs to filter the search results. 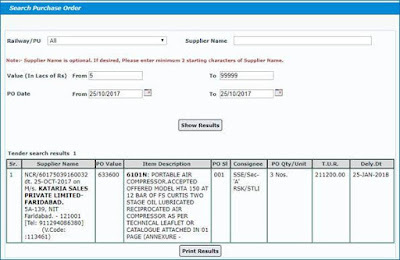 You can also search the purchase order for a particular vendor, to search the vendor name type the initial characters of vendor name and you will the list of vendors. Select the vendor name and click on Show Results to see the contracts or purchase orders awarded to that vendor. It will display the list of purchase orders (POs) to the selected vendor. Click on the link Supply Contracts (Other than Zonal Rly). It will open the search page for purchase order (PO). Great information you have been shared and it will be useful to everyone. Really too good! This is much more helps to grow my knowledge. I got huge info in this blog, the author was done the well said and I like this blog.